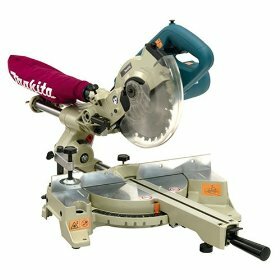 7 Half Inch Makita Miter Saws are a good choice for people who are looking for lighter, smaller saws which have almost all the main features of the well known 12" miter saws from Makita. These are quad pole slide compound saws which are extremely accurate and stable. Some of the main features of these Makita miter saws include four strong steel poles supported by four linear ball bearings which ensure accurate, wobble-free cutting with no tear-out in the bottom. They come with 10 amp motor which is quite powerful and delivers up to 6000 RPM (rotations per minute). There is a carrying handle which allows you to move or carry these saws conveniently. These 7 ½ makita miter saws have nine positive stops - 15°, 22.5°, 30°, 45° (right or left) and 0° for common miter cuts. For a small saw, the lumber capacity is quite good - 2 x 8 at 45° and 2 x 12 at 90°. There is a dust chute and a socket wrench as well. The first thing you notice in 7 Half Inch Makita Miter Saws is that they are much smaller and lighter than the 12" miter saws and 10" miter saws offered by Makita. The weight, according to the official website, is 27 pounds, which is significantly lesser than 10" and 12" miter saws. As a result, it is very convenient to carry these saws around as you travel from one jobsite to another. The double sliding mechanism, which is possibly the USP of the miter saws offered by Makita, is smooth and perfect. As a result, you can get cross cuts up to 12 inches wide. The cross cuts are surprisingly straight and there is no climbing effect whatsoever. The table is quite sturdy. The carbide tipped blade, as expected, is very good. Some of the reviewers seem to feel that the table is a tad too small. Also, there is just one clamp for the blade which is a little inconvenient. They are of the opinion that two clamps on either side of the blade would have been a much better feature. Since the vertical capacity is only around two inches, these saws are not meant for cutting large, thick pieces of wood. So, these saws are pretty much meant for finishing works and other small works. Based on what we have seen so far from a number of reviews, these 7½ Makita Miter Saws look like a very good choice for woodworkers. But they have their share of shortcomings as well. So, you can make a decision based on your needs. Return From 7 Half Inch Makita Miter Saws Page to Home.